Showdown with Lord John Whorfin! 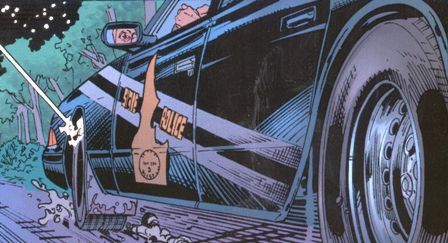 On page 1, panel 5, we see that even Mrs. Johnson's biohazard suit has a name tag that simply says "Mrs. Johnson". On page 3, Perfect Tommy figures out that Happy Wiener is really Blue Blaze Irregular #8539, Felix Frankfurter IV, great grandson of the Supreme Court Justice and nephew of the dean of the Orthodox Rabbinate of Denver. There really was a Justice of the U.S. Supreme Court named Felix Frankfurter from 1939-1962. Young Felix IV has chosen his nom de guerre of Happy Wiener as a synonym of Felix Frankfurter: "wiener" is another name for Frankfurter and "happy" is the English translation of the Latin word "felix". The Orthodox Rabbinate of Denver appears to be a fictional organization. On page 5, Tommy mentions Jimmy Page and Lady Gillette mentions Joni Mitchell. Both are guitarists/songwriters, Page most notably with Led Zeppelin. 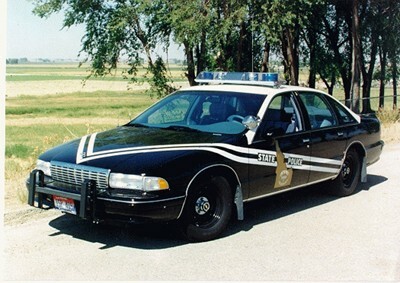 The Idaho State Police vehicles on page 11 look very much like the actual ones used in Idaho. The binoculars Whorfin pulls out of his trench coat on page 22 must be some kind of super-Lectroid binoculars to be able to see the Mir space station in orbit while he's still well within Earth's atmosphere! On page 24, Tommy says to Lady Gillette, "...don't cry for me, Argentina." This is from the song of the same name by Andrew Lloyd Webber in the 1978 musical play Evita. On page 25, Hen appears to be sitting in the same tub of blood in which Hanoi Xan was sitting in "Return of the Screw" Part 1, and has the same gnarled, old hands and abnormally long fingernails, lending weight to the supposition that Hanoi Xan is able to change his appearance drastically to appear as different people.